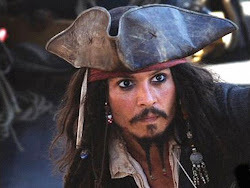 Snippets of Jack: "What I want first"
After consulting his trusted "broken" compass under the supervision of Blackbeard; Jack sets out on his own in search of the two silver chalices needed to complete the transfer of years at the fountain of youth. However, he has to get up there first. Once on board Ponce De Leon's ship the Santiago he was met by one of his trusted rivals Hector Barbossa. Jack:"You.""No...you. "Hector:"I was here first. You. Why are you here? ""Blackbeard sent me. Why you? ""Silver chalices from a royal liege. ""Oh, please. "[the Santiago starts to tilt]"Back, back! We have to balance it out! ""Right, then. What if...we each choose an item of approximately equal weight? [picks up a vase, ship tilts over again]""Put it back! We touch nothing! "[a chest slides out]"But what about that? ""The Chalices. "[Barbossa steps backwards, ship tilts once more, moving the Chalices towards him]"Oi! Why do you get to look first? ""Fine, then! "[they switch sides, ship tilts again, they crawl towards the chest and grab its lid]"...Together." Once they finished their petty argument they discovered that what they had come for had already been taken. So they set of together to steal the chalices back from the Spaniards. They watched that camp for a while and them quickly assesed that no plan was needed and popped in and snatched the chalices right out from under the Spaniards' noses. However getting out wasn't quite as easy as getting in...After being captured and tied to a tree, they shared some war stories and rum. Then of course they escaped and went their separate ways. After traversing the forest Jack and his first mate Gibbs (who was with Barbossa after the escape) found Blackbeard and after some tactful negotiations "Have you any idea how hard it was to catch that pig?!? Now before I just go handing them over, I do have one or two conditions. ""Name them." ""Firstly, I'll be having my compass back. No, that's secondly. Firstly, on your word...you will bring no harm to Angelica." "I'll make no vow to the likes of you, Sparrow." They come to an agreement, and return back to the search for the fountain of youh.